Education Flooring – 21st century seamless polymer flooring systems have evolved and advanced significantly over the last couple of decades offering schools- whether primary, secondary, or university level- some excellent choices that are hardwearing, highly decorative, UV stable & light reflective, as well as chemical, stain, and non-skid resistant. These high-performance floor coatings and resurfacers are specially engineered to absorb and endure the constant traffic while maintaining a fresh appearance. When properly installed, they should be easy to clean & maintain. Some floor coating systems offer Micro◊BLOK for added protection against the growth of unhealthy pathogens- and to enhance a school’s high standards for excellent sanitation & hygiene. Moisture mitigation and waterproofing membranes are standards in the ProRez Coatings product line-up. For noise attenuation and anti-stress fatigue under foot, there’s even our FlexFloor option with decorative polymer flakes- a highly functional & stylish system. The options- the solutions are efficiently designed, SAFE, brightly colored, and long-lasting to meet the distinct aesthetic, performance, and budgetary requirements of these diverse institutional settings. Special color blends, floor images, and custom logos are also part of the ProRez design package. It’s all about enhancing the learning environment for students, teachers, and support staff… one resinous flooring system at a time. The entryways, vestibules, corridors, and stairwells are most often the first and last impression students, teachers, support staff, parents, and other visitors will have of the school experience. These areas receive a lot of wear and tear, but still need to maintain a high order of aesthetics, hygiene, and functionality. Special consideration needs to be taken when evaluating these high traffic areas for long-term abrasion, chemical, stain, non-skid, and UV resistance. These areas need to provide good traction to prevent slip and fall incidents, yet easy to clean and maintain. Bright, vibrant colors- solid or iridescent, or decorative particle blends like ceramic quartz, rubber granules, or stylish polymer flakes can really set the right tone and atmosphere for the student body. A customized school logo strategically placed in the flooring system can also inspire real school spirit. 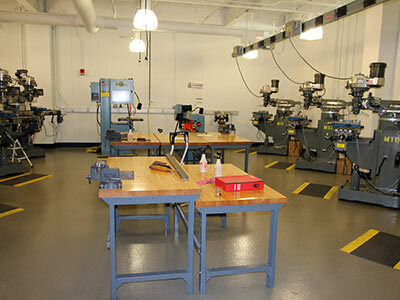 In addition, there’s no waxing, polishing, or buffing required over the life of these flooring systems. 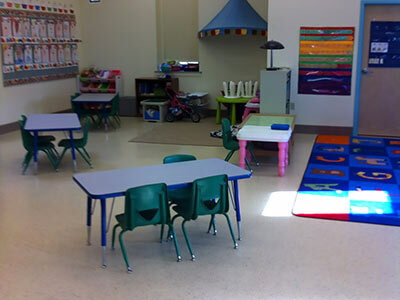 The classroom and support learning centers require careful consideration in selecting a flooring system that complements and enhances overall atmosphere, aesthetics, and functionality. The right floor coating or polymer resurfacer; whether opaque or iridescent color, or color blended media, along with hardwearing performance and longevity are a just a start to designing the right seamless finish. 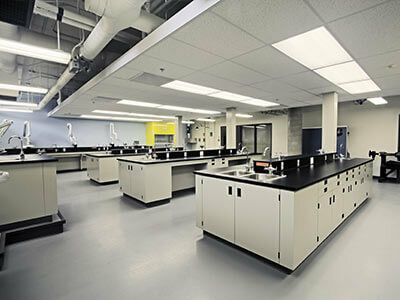 School laboratory environments need to provide excellent stain and chemical protection while enhancing safety with non-skid resistance. This seamless and non-porous flooring system needs to be easily cleaned & maintained. Highly durable and hardwearing, the polymer floor coating also needs to be impact and abrasion resistant. 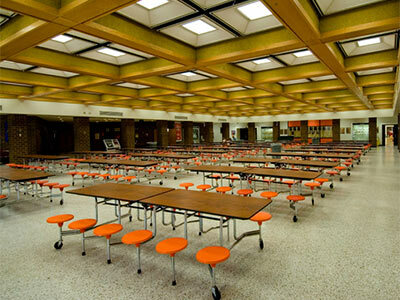 Today’s cafeteria’s are most often multi-use spaces, with considerable activity and foot traffic throughout any given day. A seamless floor coating or resurfacing system selected in these areas will need to provide both functionality and aesthetics. The flooring system needs to be hardwearing, with both impact and abrasion resistance. Ease of cleaning and maintenance are critical given the tight meal service rotations found in most school systems. Added hygiene and sanitation can be built into the polymer coating with Microbe◊BLOK, an antimicrobial film preservative. Unlike conventional vinyl composite flooring, a resinous flooring system does not require the long-term life cycle costs associated with waxing, buffing, and chemical stripping. As far as aesthetics, ProREZ offers a broad range of stylish design options in various colors, patterns, and textures to complement any décor. The school kitchen requires a flooring system that will endure the many meals produced, assembled, and served out of this area. These kitchen areas need to be easily cleaned and maintained, with excellent hygiene and sanitation. Microbe◊BLOK, an antimicrobial film preservative is often incorporated into kitchen polymer systems. 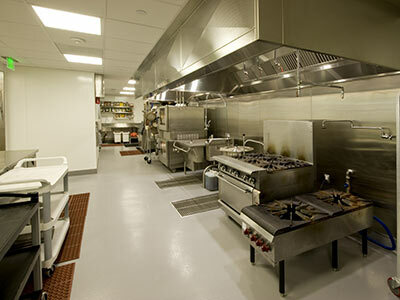 Depending upon the equipment used in the school kitchen, the resinous flooring system may also need to be resistant to thermal shock and cycling. Overall, this seamless, non-porous polymer coating needs to be hardwearing with abrasion and impact protection, as well as chemical, stain, and non-skid resistance. 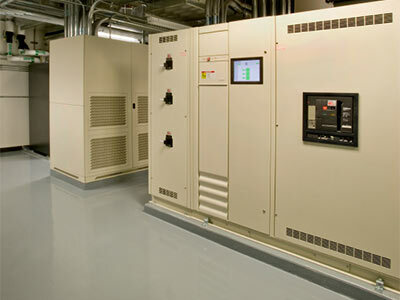 Mechanical rooms may be situated in a basement area or an elevated concrete slab on deck in a Penthouse located above other occupied spaces. These areas need to be waterproof to any potential leaks from the roof or malfunctioning of water, air or heat supply systems. The Mechanical Room (MR) system is typically a high-build resurfacing material (1/8”-1/4”) utilizing a waterproofing elastomeric membrane to prime/seal the substrate with an aggregate-filled polymer overlay- and broadcasted with natural silica quartz. Surface finish of the Mechanical Room (MR) system can be varied to accommodate different levels of non-skid and chemical resistance. This seamless flooring application also provides excellent protection against point-impact damage, vibration and substrate movement. 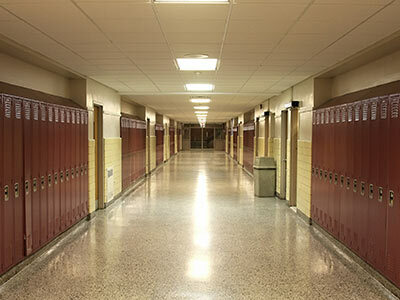 The school locker room and restroom areas are facilities often exposed to wetness. These areas also receive a lot of foot traffic. The resinous flooring system selected for these areas needs to be highly durable, easily cleaned, hygienic and slip resistant. The waterproof surface also provides long-term chemical, stain, and abrasion resistance. ProREZ offers a broad range of decorative options in various colors, patterns, and textures. The FlexFloor system with its specially blended polymer flakes can provide design appeal and excellent functionality along with noise attenuation and anti-stress fatigue under foot. In maintenance or workshop areas, the flooring system must be tough and hardwearing to endure heavy workloads, dropped tools, spilled fluids, and large equipment used to fabricate, tool, and repair items. Ease of cleaning & maintenance coupled with non-skid resistance are needed to enhance overall safety and appearance. Chemical, stain, impact and abrasion resistance are also important considerations. A broad range of standard colors, with a light-reflective finish can also make this area a more pleasant work environment.